This week Larry King retired after hosting his CNN show Larry King Live for 25 years. LARRY KING: Do you have a personal favorite? LARRY KING: All your works, everything you've done. MICHAEL CRICHTON: I think I would show them a book called Travels that was sort of autobiographical. LARRY KING: The least known of your books, maybe? ROSE: Of all the things you have done, what has brought you the most psychic income, satisfaction? CRICHTON: Whatever is really difficult. ROSE: The more difficult, the more pleasure? CRICHTON: Yes, more -- it was very difficult for me to do a book 20 years ago called "Travels" that was -- because it was about myself and I don’t like to talk about myself. ROSE: I liked it actually. CRICHTON: Thank you. And I am trying to do another one. Travels is by far my favorite of Michael Crichton’s works. As I wrote in an earlier post, Crichton himself, during an online discussion, told me he was working on a sequel. Let’s hope we’ll see that published someday. 1. I will not answer or even attempt to answer questions about Crichton’s personal and private life. My blog is not a gossip site. 2. I will not do anyone’s homework for them. So I will not answer questions about Crichton’s novels that could be easily answered by reading the book. 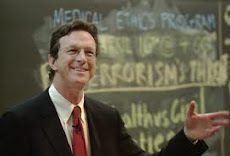 Check my blog post Michael Crichton on Yahoo Answers to see what I mean. 3. I will not answer questions that are purely subjective and a matter of interpretation. For example, is Michael Crichton a better writer than (fill in the blank). Let me make clear that I cannot guarantee when I will be to able answer a question, so people facing deadlines for their homework should not rely on me to get back to them in time. It takes time to search my archives and library databases. Questions that I think will be interesting to other readers will be answered on this blog. I’ll contact you to see if you want to be publicly credited. Here’s your chance to let me know what you would like to see on this blog. Last year I updated “A Michael Crichton Christmas" to include Pirate Latitudes. My good friend Erik and his friend Angel, with some help from their families, created a video based on it.